Home » German Biedermeier fashion 1825 to 1830. Top row left: Fashion of polite society. Great bourgeois clothing 1825 to 1830. Right: Great bourgeois clothing 1815 to 1820. Bottom row left: Clothing of polite society. Great bourgeois clothing from 1820 to 1825. 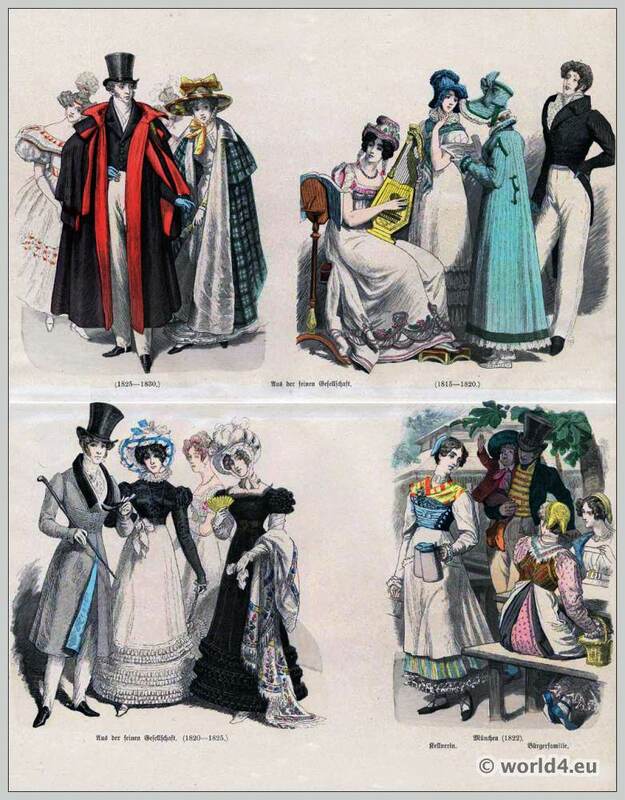 Right: Munich fashion of the year 1822. Costumes by waitress in a traditional munich dirndl and middle-class family. Source: On the history of costumes. Münchener Bilderbogen. Edited by Braun and Schneider 1860. Romanticism, England Georgian Regency, France Directoire, First Empire, Neo Classical. Fashion during the french revolution. Paris 1793 to 1795. By Julius M. Price. Les Incroyables et Merveilleuses. Drawings by Carle Vernet, Horace Vernet . The French Republic 1789 to 1804. Fashion during the directoire. By Augustin Challamel. Reign of Napoleon I. 1804 to 1814. French Empire era, in England the Regency or Georgian fashion era. Reigns of Louis XVIII. and Charles X. 1815 to 1830. The Restoration or Romanticism fashion era. German Biedermeier. Fashion and Costumes of the The Second Republic. 1848 -1851. Victorian era. “Second Rococo”.